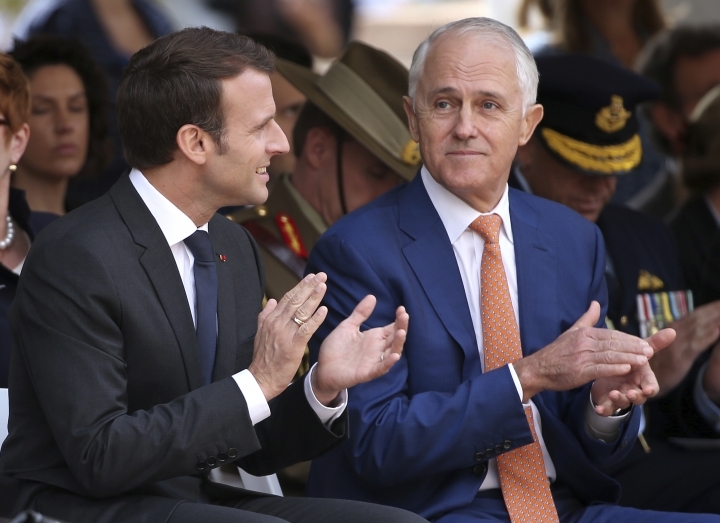 SYDNEY — French President Emmanuel Macron and Australian Prime Minister Malcolm Turnbull on Wednesday issued a reminder to China to respect a "rules-based" order in the South Pacific amid concerns about Beijing's growing influence in the region. Macron also stepped up his calls for the renegotiation of the Iran nuclear agreement, regardless of the outcome of the May 12 deadline for President Donald Trump to decide whether to abandon the deal and reimpose sanctions against the country. 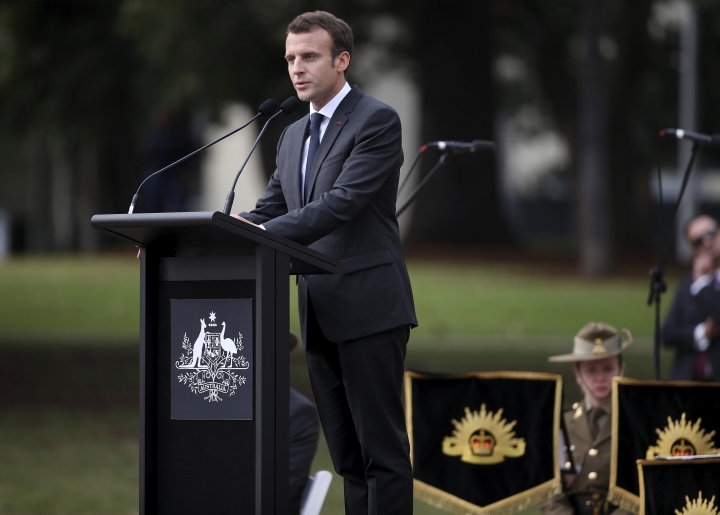 Macron's comments came during a three-day visit to Australia, during which the two nations signed a range of agreements, including a pact to strengthen defense ties. The two leaders were also expected to discuss China's growing influence in the South Pacific. Australia has become concerned about increasing Chinese investment in infrastructure projects in the area, especially reports — denied by Beijing — that it wants establish a permanent military base in Vanuatu. This follows China's contentious claiming of islands in recent years in the South China Sea. 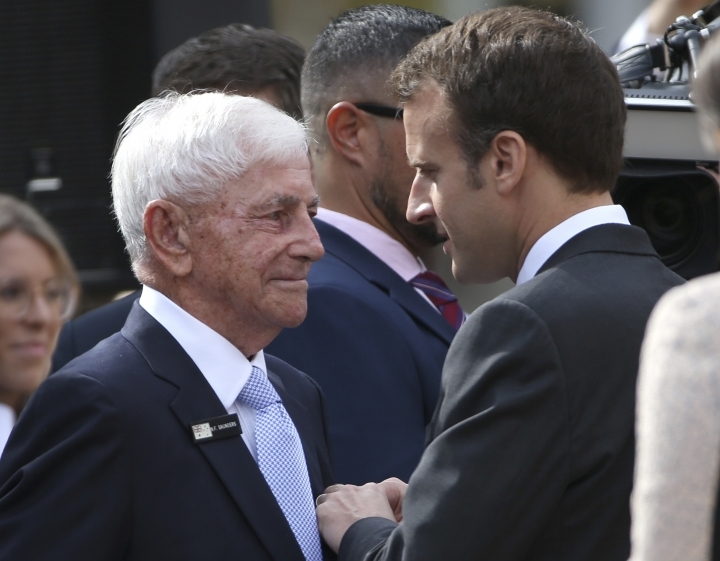 Macron was scheduled to depart on Thursday for New Caledonia, a French-controlled island near Vanuatu, which will hold a referendum in November on breaking away from France's protection and becoming a republic. While Macron and Turnbull did not specifically confirm they discussed China during their Sydney meetings. But when asked about Beijing's South Pacific push at a joint news conference, the two leaders were eager to stress the need for lawful development in the area. "China's rise is very good news for everybody. It's good for China itself, its middle classes, and it's good for global growth, and regional growth," Macron said. "What's important is to preserve a rules-based development in the region, especially in the Indo-Pacific region, and to preserve the necessary balances In the region." "And it's important not to have any hegemony in the region," he said. Turnbull said the economic rise of China was made possible "by a ruled-based order in our region". "We welcome further Chinese investment in our region. We welcome the benefits of the growth of China. But of course we are committed to the maintenance of the rules-based international order, to good governance, strong standards, that will enable us all to continue this remarkable arc of prosperity that has been enabled by that rule of law," Turnbull said. Turnbull cited an oft-used quote from former Singaporean Prime Minister Lee Kwan Yew in pushing for mutual respect among nations in Asia, saying "big fish cannot eat little fish, and little fish cannot eat shrimps." 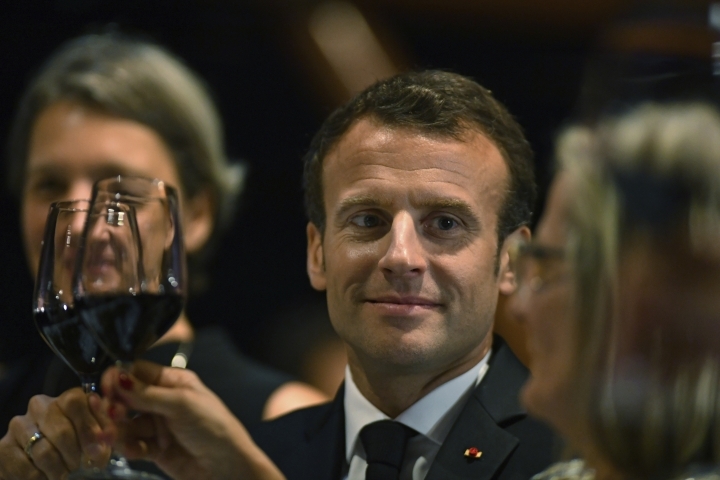 Macron added: "And especially New Caledonian shrimps." France is the only European nation with direct territorial links to Pacific region countries, which play a role in its defense building. It has more than 1.5 million citizens and 8,000 military personnel spread across several territories in the Pacific and Indian oceans. 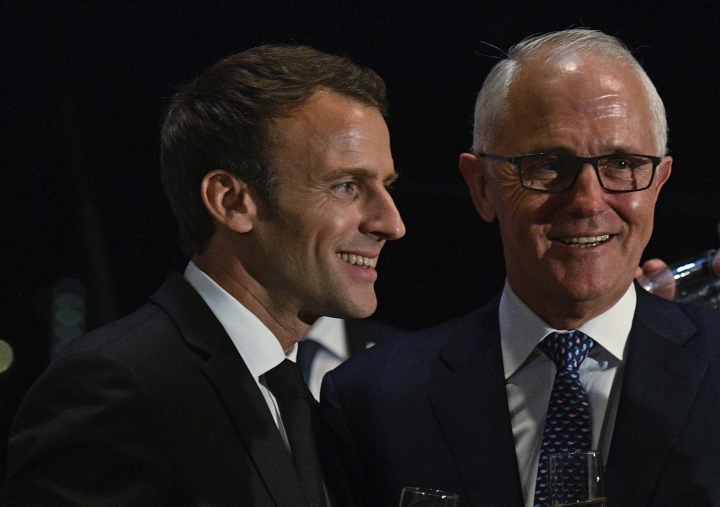 Macron said he was keen for France to build a broader strategic relationship with Australia. 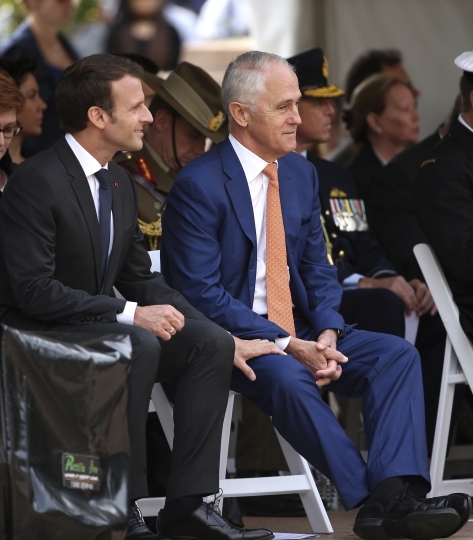 Already, a French company Naval Group is building Australia's new fleet of 12 submarines at a facility in Adelaide, under a deal worth $36.3 billion. 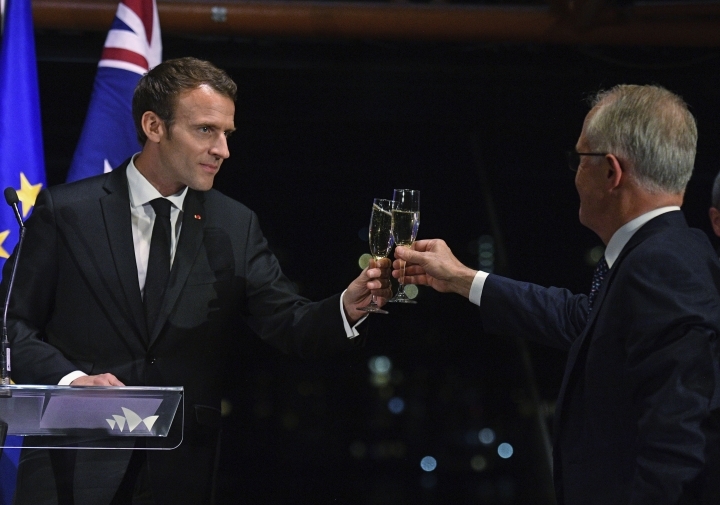 Also as part of Macron's visit, France and Australia signed pacts to strengthen military ties, both through cooperation in maritime activities and the establishment of an annual Franco-Australian defense industry symposium. 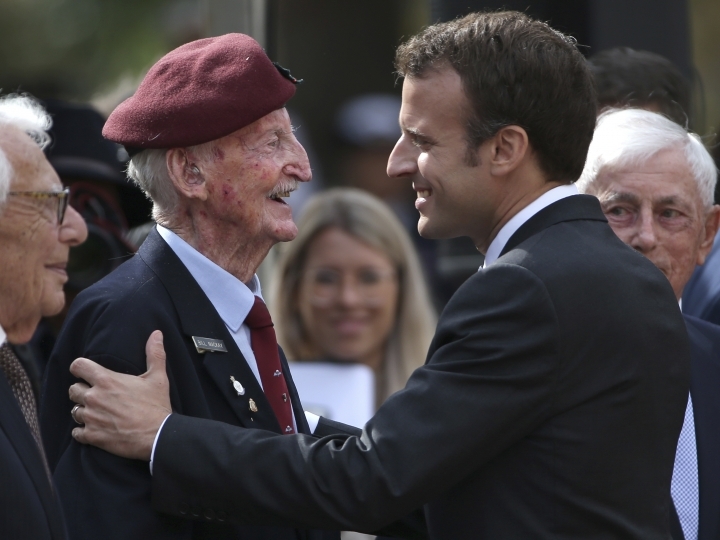 Macron also expressed a desire for France to be "at the heart" of the Indo-Pacific region. 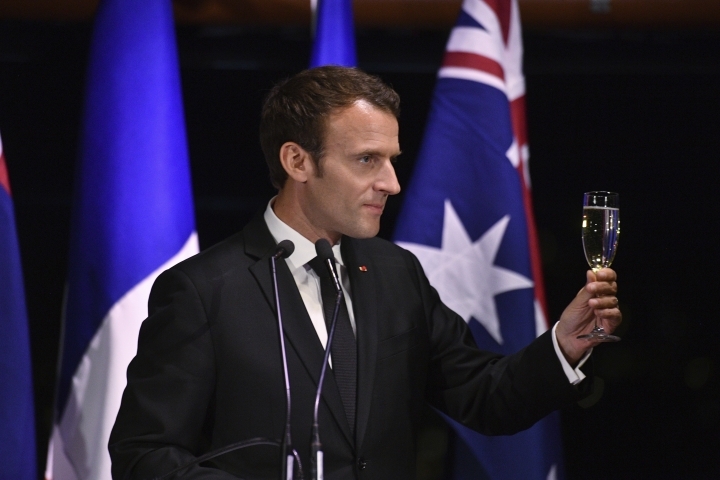 "I believe we have one shared goal, that is to turn our two countries to place them at the heart of a new axis, an Indo-Pacific axis," Macron said. Asked about growing tensions about Iran's nuclear weapons capabilities, Macron said that regardless of Trump's May 12 decision a new agreement should be negotiated with Teheran. Macron, who told the United Nations last September that the current deal was not sufficient, said it should be broadened to address three new main areas — Iran's nuclear activity after the current deal expires in 2025; improvements in the monitoring and controlling of Iran's domestic nuclear activity, and to have better containment of Iranian activity in the Middle East, especially in Iraq, Syria, Lebanon and Yemen. Macron, who visited Washington last week, said Trump responded "positively" to his recent suggestion for a new agreement while he had also "exchanged about that" in the past few days with Iranian President Hassan Rouhani and Russian leader Vladimir Putin. Macron said whatever Trump's coming decision, a broader deal was needed because "nobody wants a war in the region and nobody wants an escalation in terms of tension in the region." 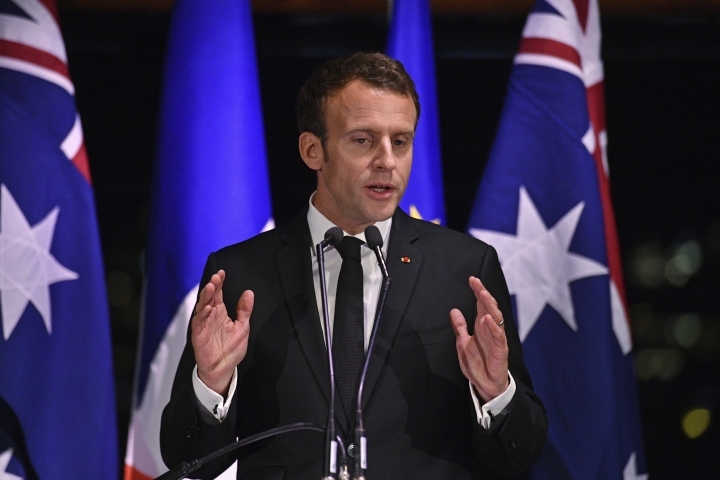 With trade talks also a key part of the visit, Macron said France would support formal talks on a free trade deal between Australia and the European Union after it found solutions to concerns it had on agriculture. The countries also signed agreements to counter cyberwarfare and on committing to strategies addressing climate change, including working to make coral reefs in the Pacific more resilient. 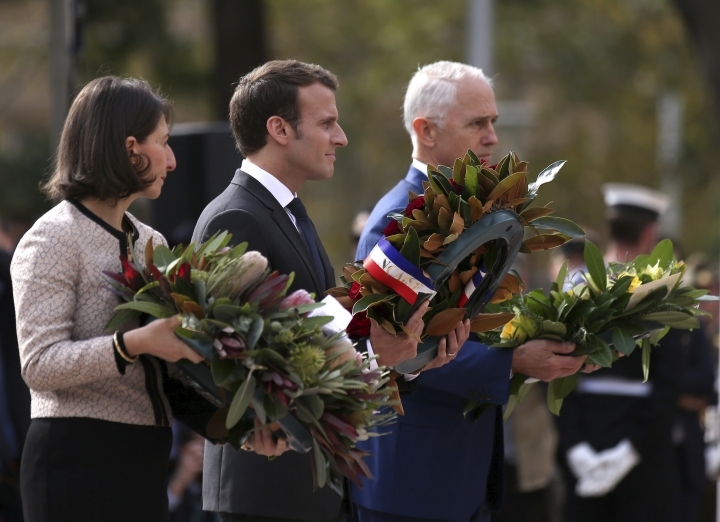 Macron also used a ceremony commemorating Australia's wartime cooperation with France to highlight a global worldview as a counter to nationalism. 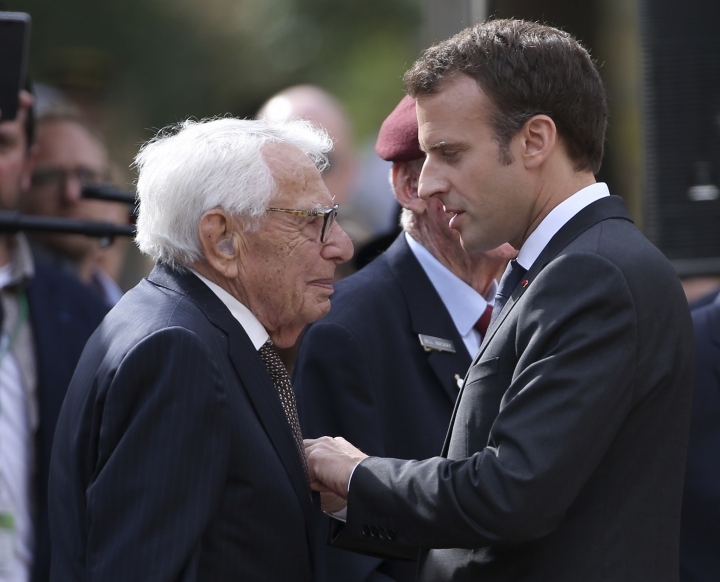 A week after criticizing Trump's "America first" policies on his trip to Washington, and hours after a May Day gathering of European anti-immigration populist leaders and violent right-wing protests in his home country, Macron said the Australia's wartime sacrifice in Europe should serve as "a powerful message at a time when nationalism is looming, entrenched behind its borders and its hostility to the rest of the world." "No great nation has ever been built by turning its back on the world," he said.